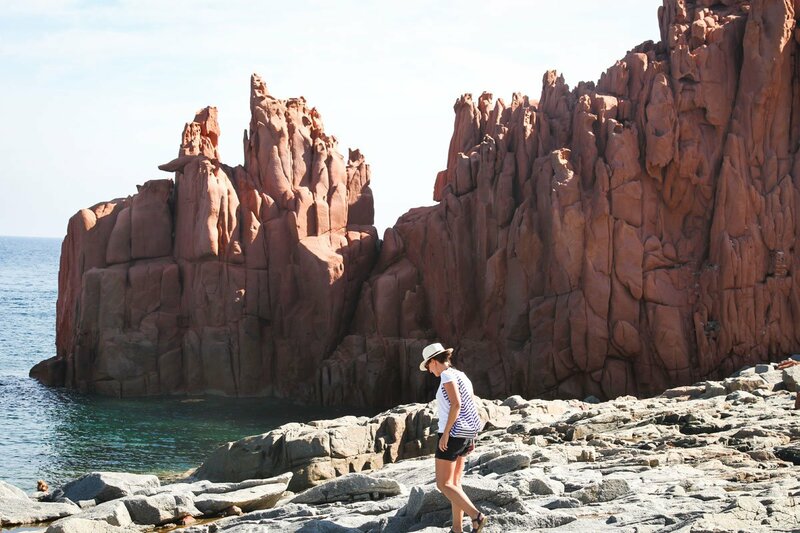 SARDINIA, Italy – Ashley Muir Bruhn of Hither & Thither, one of took a road trip with her husband around Sardinia in search of the perfect beach. 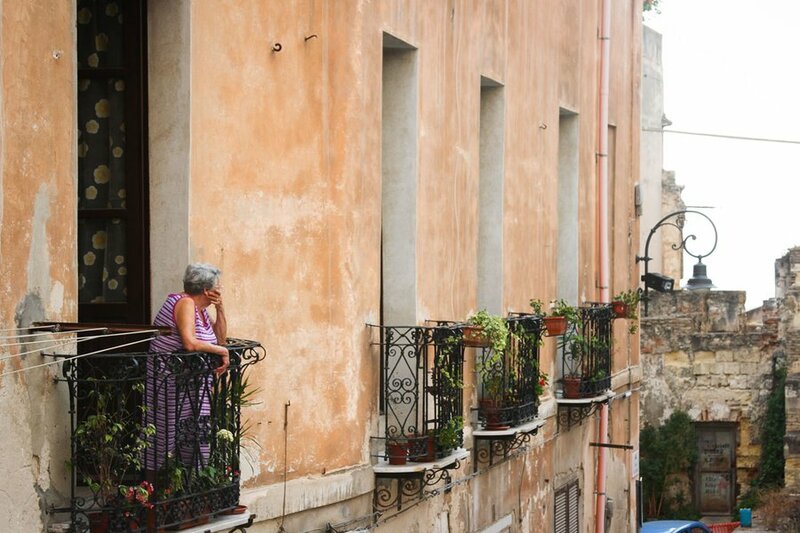 They took in local pastries, salumi, cheese, and wine for their daily lunches, and wandered through centuries-old towns. These are our favorite photos from their trip. We took the photo above when we took a detour from our original destination, Arbatax, to stop at Costa Rei. Those red rocks, famous in the area, were lovely. We could see why they graced so many postcards and guidebook covers. But with all of the beautiful coastal scenery on the island, this felt like an unnecessary stop. Pane carasau is a traditional cracker-like flatbread that was made to last several months in the mountain shelters where shepherds would spend the night. 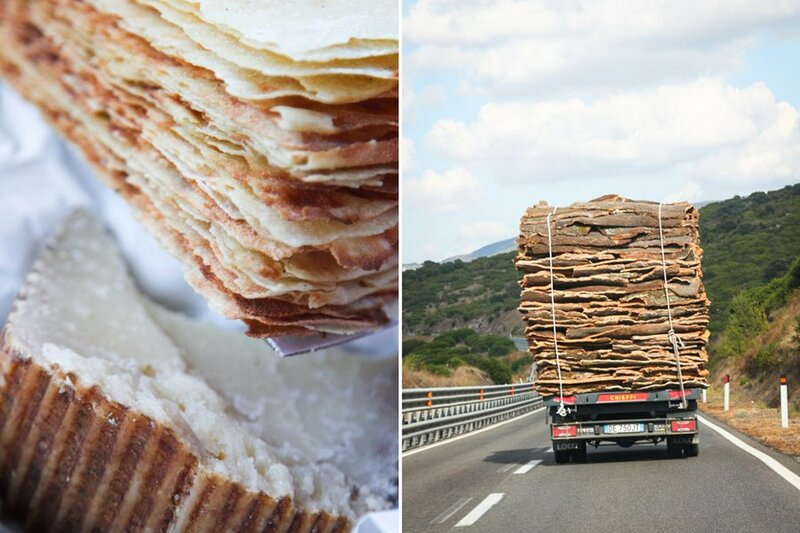 It is also sometimes called carta da musica and is found all over Sardinia. The region is also famous for its cork. We drove through groves of cork oak trees, and shared the road with a truck bearing a full load. 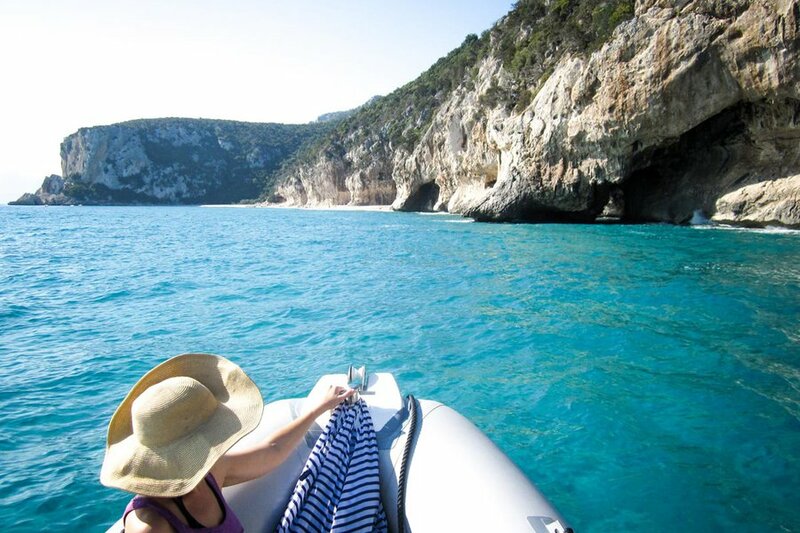 Golfo de Orosei is a beautiful stretch of coastline along Sardinia's east coast. It's only accessible by boat. 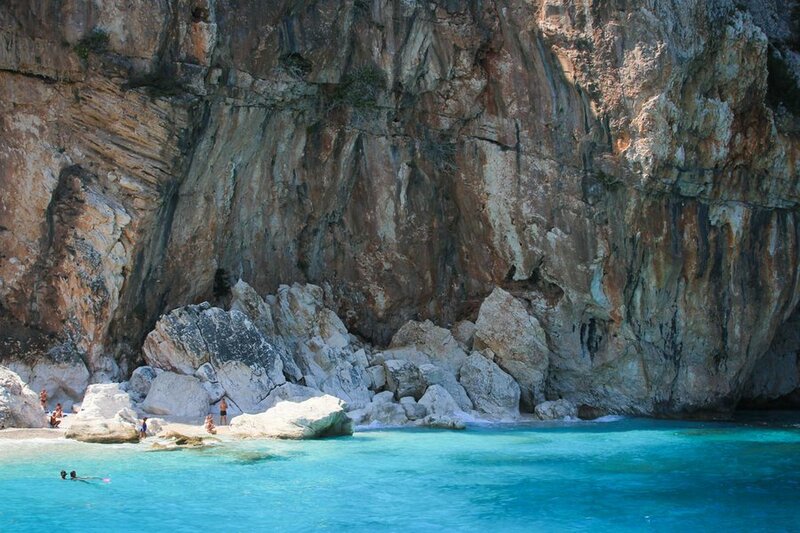 False inlets make for beautiful beaches between the bright turquoise sea and the giant, white cliffs of the Gennargentu. Cala Marilou had a bit more of a crowd, but it also had a little stand where we could buy drinks. On the way back to Cala Genone's port we alternated between speeding along the coast, joking with and racing against another small boat of older men, and slowing to admire the views in the changing light. 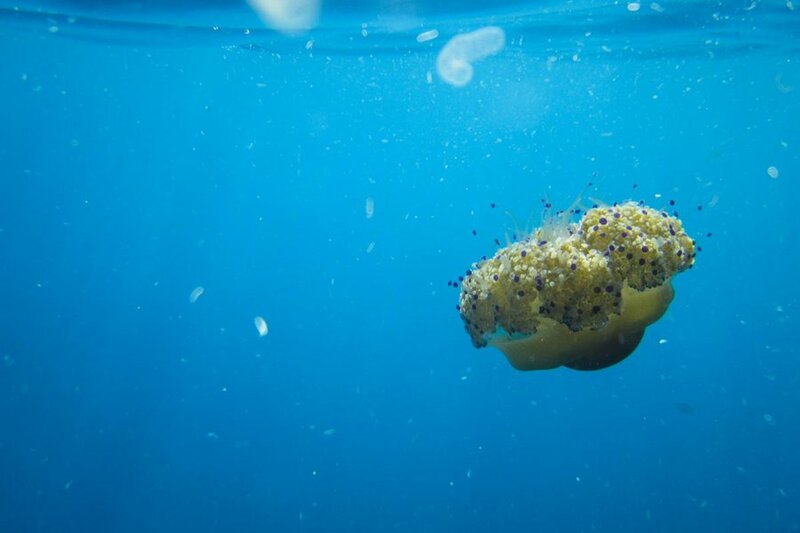 At one point, we stopped to circle a beautiful jellyfish. The port at Cala Gonone was busy when we returned. 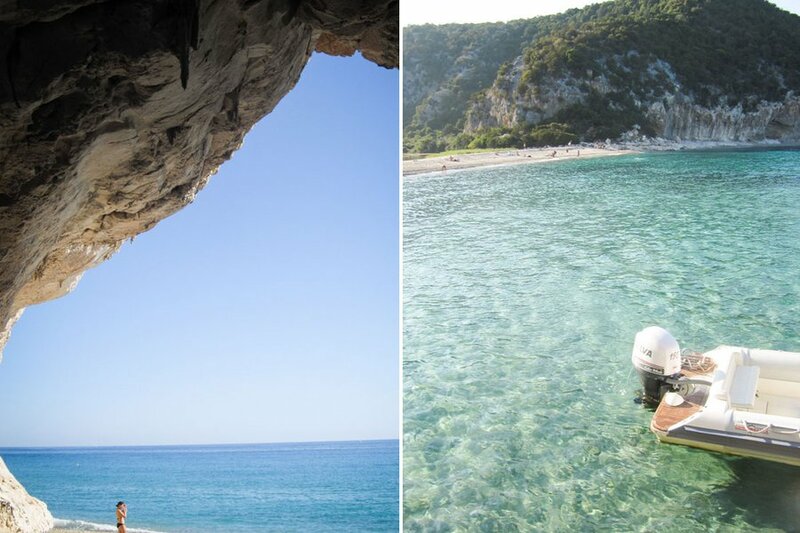 Cala Luna, which you can actually trek to from Cala Genone in about two and a half hours, is especially striking for its beachside caves. We set up our towels in the shade of a cave for lunch. 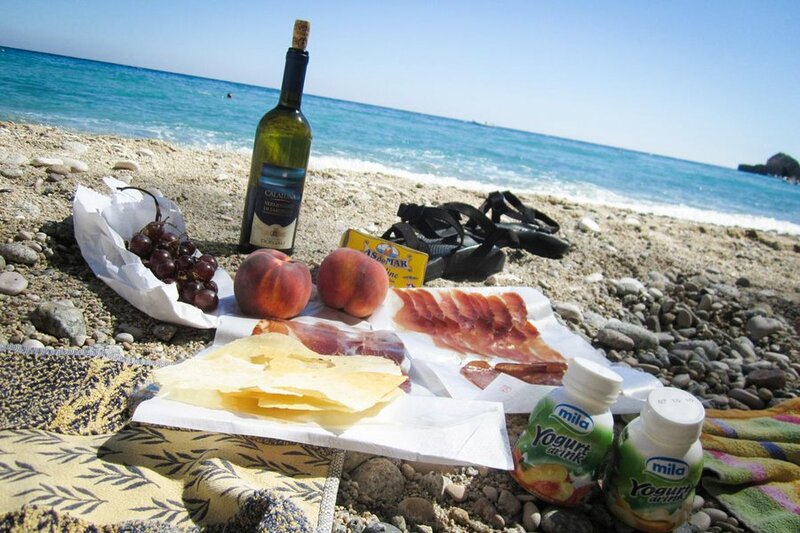 There was a small restaurant behind the beach that supplied us with bottles of wine over the course of the day. 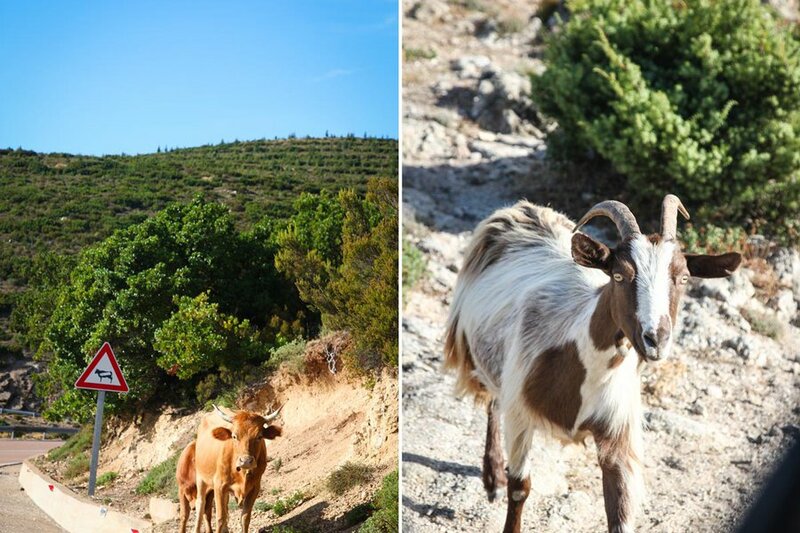 Sardinia is known for its minature donkeys and miniature red cows. We spotted an adult cow and calf standing conveniently by a sign alerting us to the presence of cows. Some goats also came to investigate our car. On another day we headed from the countryside to the resort area of Villasimius. We stopped just outside town when the beach came into view; the golden sand and beautiful water seemed a good setting for lunch. The restaurant wasn’t open yet, so we sampled limoncello and a regional grappa-like throat-burner, Filo e Feru, before continuing to town. 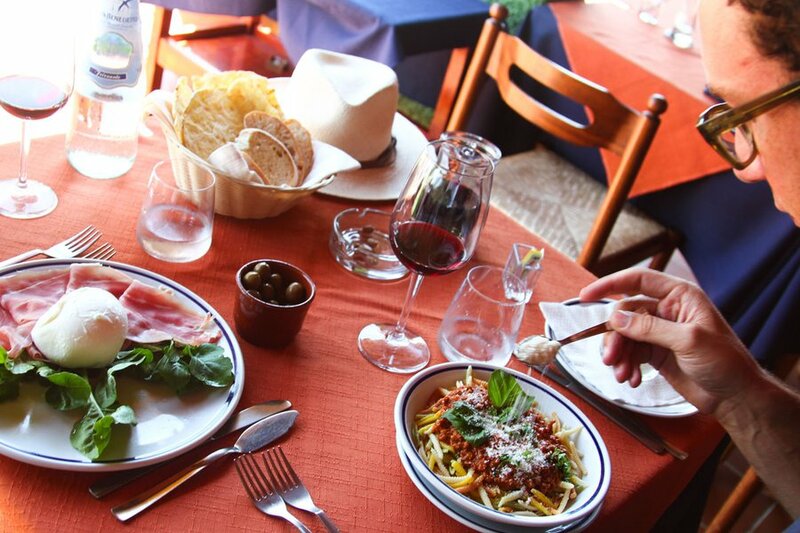 Someone recommended L’Aragosta, a little lunch spot just off the beach. 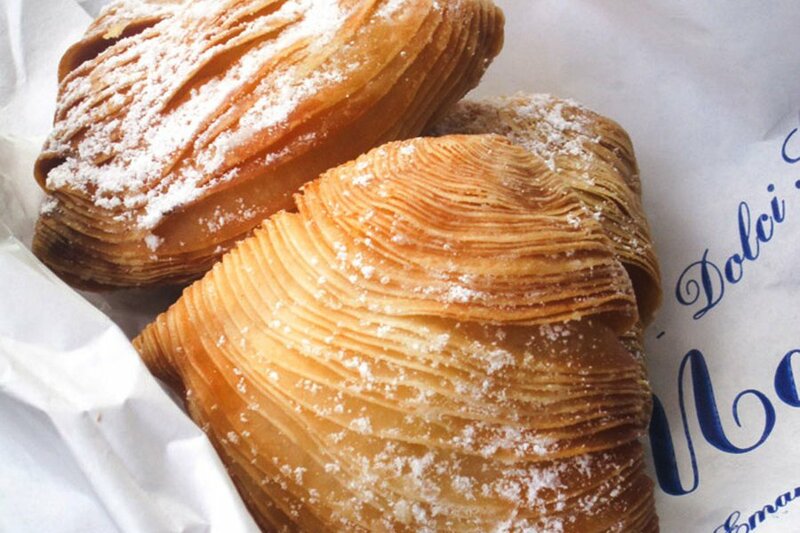 We took some pastries to go. On our way out of town to find Campu Longu, we passed by a weekend market and decided we had to pull over. 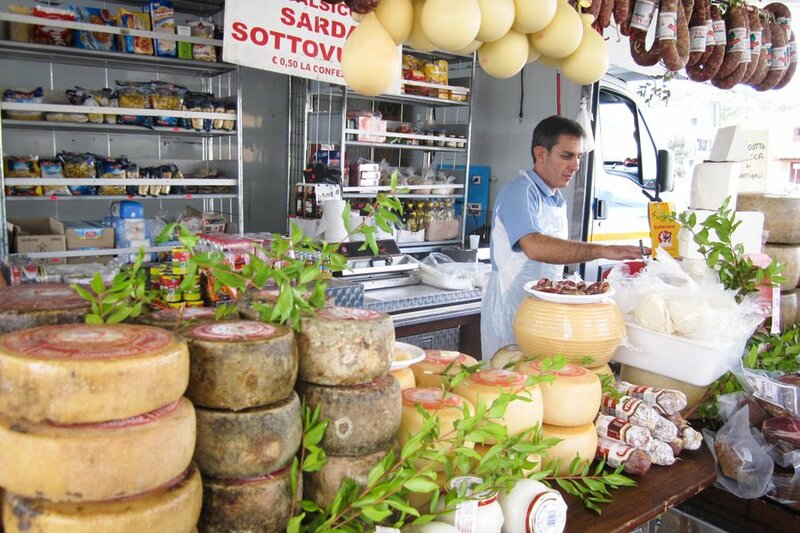 The very first stand was a cheese and meats vendor with stacks of pane carasau and bottarga. 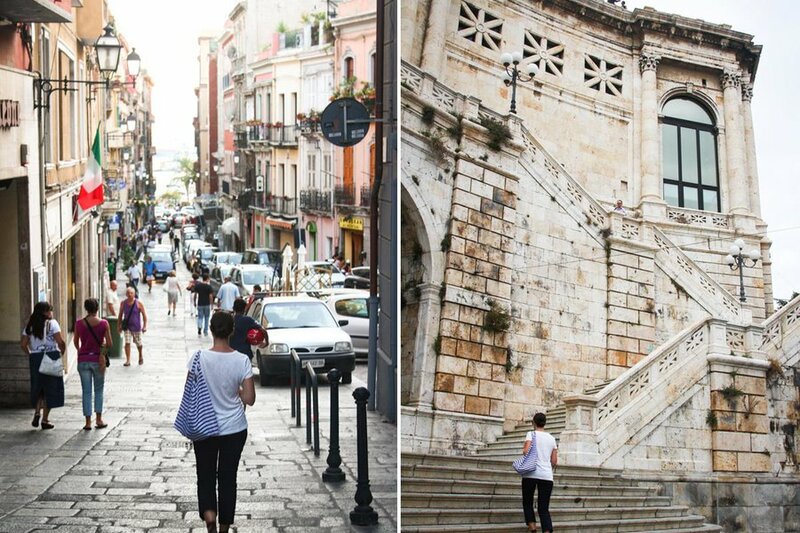 Cagliari emerged as a city around the 6th century B.C., so it has a nice mix of the old and the new (though most of its notable old sites date more to the 16th-18th centuries). It's still a bustling port today. The streets were crowded, even as shops were just reopening from the afternoon siesta. 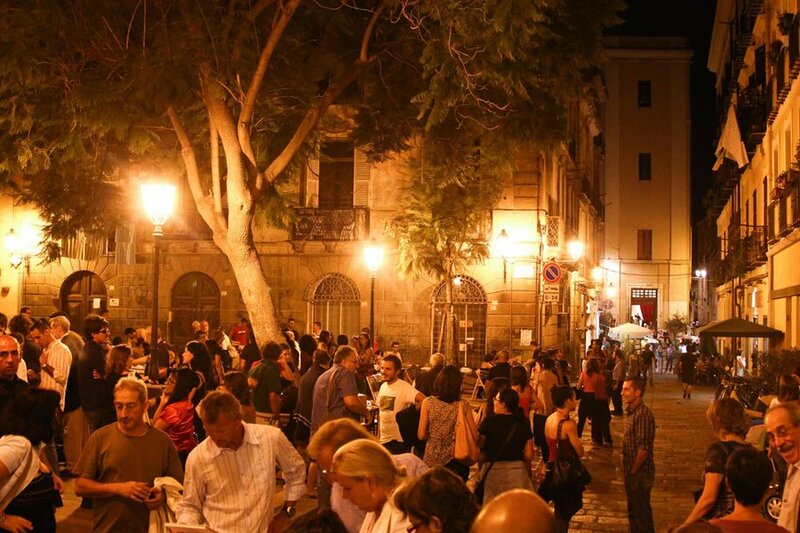 On our last night, we watched the crowds amble from open-air readings to dance performances before heading to a late dinner. These photos originally appeared on and are republished with permission. 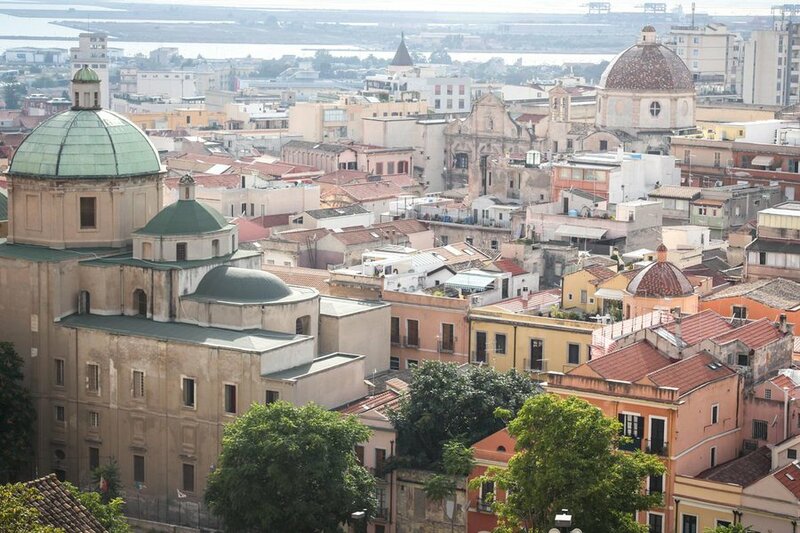 From its old citadel, you can look out at the working shipyards and red-roofed buildings that enclose piazzas and churches and cosmopolitan shopping streets. Ashley is a freelance writer and editor, and the creator of one of Gentedimontagna's 24 Best Blogs and Websites, . You can follow her at @AshleyMuirBruhn on , , and . She travels for the fresh perspective.